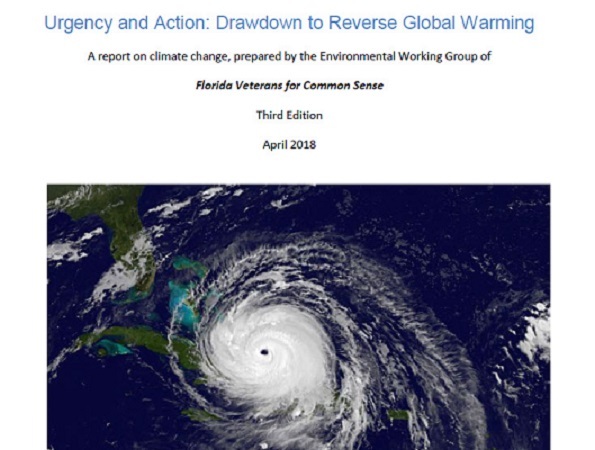 The members of Florida Veterans for Common Sense are committed to creating a stable climate. This report provides our vision of the problem and solutions, together with concrete and practical actions that citizens can take. Global warming is real, it’s bad, and it’s caused by us. There are solutions which are not costly – in fact, if we act wisely we will realize economic benefits. But we must act now. of special note to us veterans, disruption of national security. There is reason for hope. We have the technology and know-how today to meet the challenge. The economic benefits of making the transition to a carbon free society make it financially worthwhile. Most of all, the tide of public opinion has shifted toward the people wanting action on climate change, which means the political will for a stable climate is within our grasp. What remains to be done is to convert these favorable circumstances into effective and timely action. Our report lays out a practical and concrete action plan to reverse global warming. It starts with understanding the nature of the problem in terms of its causes. An often-heard phrase is, “All we need to do is replace fossil fuels with renewables, and the problem will be solved.” This is a dangerous oversimplification that does not take into account that removing carbon from the atmosphere and storing it in the soil is part of the solution. Also, anything that burns will emit greenhouse gases (GHGs), and we have some sources of energy that are referred to as “renewable” that are burned and hence are contributors to GHG emissions. Another important concept is our food system’s contribution to climate change – as much as 20-30% of the total. Understanding and correcting the inefficiency of our food system is essential to dealing effectively with the problem. Armed with an understanding of the problem, one can take stock of the carbon footprint in one’s own realm, that is, in your family’s activity and at your business. Once you estimate your carbon footprint you can assess your impact from buildings (including houses), transportation, diet and by what you buy. Our guide will help you take the food system into account and help you see that while carbon in the atmosphere is the problem, storing carbon in the soil is a solution. This leads one to support native landscapes, community sponsored agriculture (CSA), organic, and biodynamic farming. we will be better off all around if only we act now. The workplace offers a great opportunity to magnify efficiencies many times over. Villages, HOAs, condo associations and other community entities can be wonderful platforms from which to stabilize the climate. We can also vote in the marketplace by divesting ourselves and our organizations of holdings (stocks/bonds) in companies responsible for carbon emissions. We can and must take action by communicating to elected officials what kinds of changes we want to see: energy saving local building codes, natural (chemical free) landscape rules that re-forest our communities, state energy portfolios and virtual net metering (which allows utility customers to share the electricity output from a single solar power generator). Most important, we must make clear to our people in congress that we want a steadily rising price on carbon, with all the revenues going back to the people. By joining and/or supporting Citizens’ Climate Lobby and the Move to Amend Coalition, we can nudge our federal government towards a stable climate and a restoration of our democracy. Clearly it is time for individual citizens, businesses and governments to take action. Our task is clear: to reduce greenhouse gas emissions by 40-50% by 2025 in the near term and achieve net zero emissions by mid-century, and at the same time increase the carbon we remove from the atmosphere and store in the soil.